Browsing the Web, I found this plugin. Interesting as it looks like AM-Munition! It has 2 channels/compressors, M/S Mode, channel link, soft clipping, threshold with auto make up gain (similar effect to the threshold of the AM-Munition in 'Master' section ), the metering graph with the clipping leds above, sidechain (see 'Int : Ext' knob), sidechain monitor, pre and post saturation (similar to the 2 stages of clipping in AM-Munition's 'expert' settings) and much much more: I downloaded the PDF manual and still other similarities are glimpsed!!!!!! Has anyone noticed this before? For me, it's the AM-Munition, apparently updated in a new version and skin!!! Almost everything is very familiar! @Sascha Is/was the developer. I was thinking this a few weeks ago whether it was his new version of Ammunition. Thanks, guys! What a cool!!! So, a good toy to test!!!!! 1 - Is "Int : Ext" knob in "Sidechain" a kind of "Mix" (processed / unprocessed signal) feature? In AM-Munition this knob is called "Source", isn't it? 2 - And what about "Level" (AM-Muniton's "Sidechain"): is it the VOLUME of sidechain? To make that clear, that was neither a port nor a succession of ideas. I hate repeating myself through projects, and it wouldn't do past work and people involved any favour. While I did both plugins' DSP code (and - hehe - Sebastian made both UIs...), the two only share some features like M/S and external SC input, along with a central metering section, where I considered M/S important, and the centrical layout was quite obvious for Basti when we layed out the concept (he even did a 3D model of the virtual 'inside', as can be seen here). But looking more closely probably reveals important differences. Ammo is basically an opto comp in series with a limiter & dual-band saturator, which already is quite a strange combination, while Presswerk is more a compressor construction kit designed to mimic pretty much everything known from the hardware world. PW is more versatile, and its only 'signature sound' comes from the saturation section and optional phase rotator, while Ammo has more flavour right away, but is also more aggressive & up-front. You just can't substitute one for the other. Thank you very much for your explanation! I'm a big fan of your work! It seems that Master Kraznet is very busy these days. So... is there anyone that could answer my questions, please? I know they can sound very basic, but not for me... the classic video tutorials do not cover my questions, perhaps because they presuppose previous knowledge, so I launched them here. The 'Int:Ext' control balances the incoming source that the detector circuit 'sees'. Turned fully to Int only takes the plugin's own signal into account, while Ext will make it only listen to the sidechain input you select in the plugin dialog's menu of possible external inputs. 'Level' is indeed that simple, it controls the external sidechain volume. Have checked out this old Kraznet video on sidechaining in Samplitude? Sorry I didn't reply to your question I am somewhat busy at the moment. Although it looks like Sascha has replied anyway. Thank you all very very much!!!! All Sascha's work is highly musical. AM|Munition is my main mastering tool, I feel like it's my secret weapon - love it. 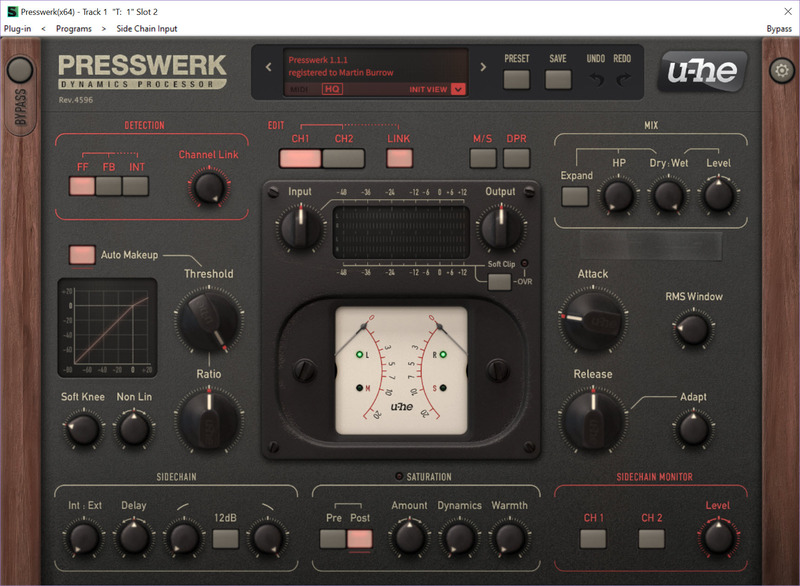 I got Presswerk as soon as it was available, great processor and highly recommended. Just a heads up u-he is doing a 25% discount if you sign up to their newsletter before the end of the month. I used it to buy Presswerk yesterday and this is one amazing plug-in and sounds incredible. I have to say it's the most beautiful well thought out GUI I've ever seen and the fact that the GUI is scalable is great as well. I think this will be my go to compressor from now on. You've done an amazing job @Sascha !! For the UI, credits go to Basti (https://u-he.com/about/team/sebastian.html). A 3ds Max & V-Ray superhuman. He was the one who designed the majority of Samp plugins (AM/VE/Revolta/BB2/Vandal) back in his days at Magix. @Sascha Basti certainly has an amazing design style and accounts for the unique designs of those older MAGIX plug-ins.!! One question I must ask Sascha is to do with using it with my Behringer X Touch using Mackie Control protocol. If I use my controller to tweak the controls I noticed that for example moving the first pot adjusts the threshold and moving the 2nd pot moves a red dot independently to the actual threshold control. This is happening with all the controls. What is the difference between moving the control and moving the red dot? See GIF. It looks like a kind of Ratio (see left graphic), but I also would like to know about that. That small red dot always belongs to the 'other' channel. You exchange knob & dot by selecting the channel to edit. This is not so intuitive with remote cc, but there was no way around it.